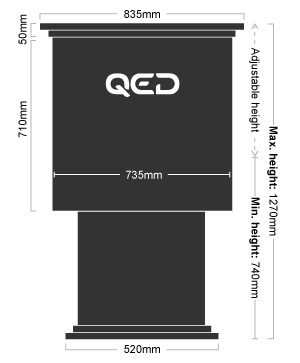 QED's unique height adjustable lecterns ensure that the main speaking position is accessible to all. The lowest position provides access for wheelchair users and the highest position accommodates the very tallest person. They can be operated from any location and have the capability of dual control. Just one cable provides both the power and control to the lectern. A power board inside the lectern provides additional power for other devices such as laptops and cue lights. The lecterns have interchangeable aluminium panels for ease of recovering and can also be custom modified to produce different styles. The in-built microphones and LCD monitor make each lectern a totally integrated technical facility. The lecterns transport in wheeled flightcases for protection and ease of handling.